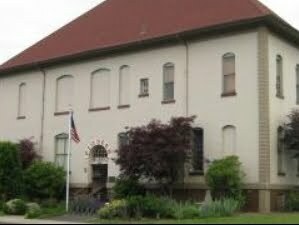 On April 8, 2015 I tried to find the two unmaintained common section corner monuments that were set by a General Land Office survey team in in 1857. I was unsuccessful; but if I can acquire more precise coordinates I will try again. 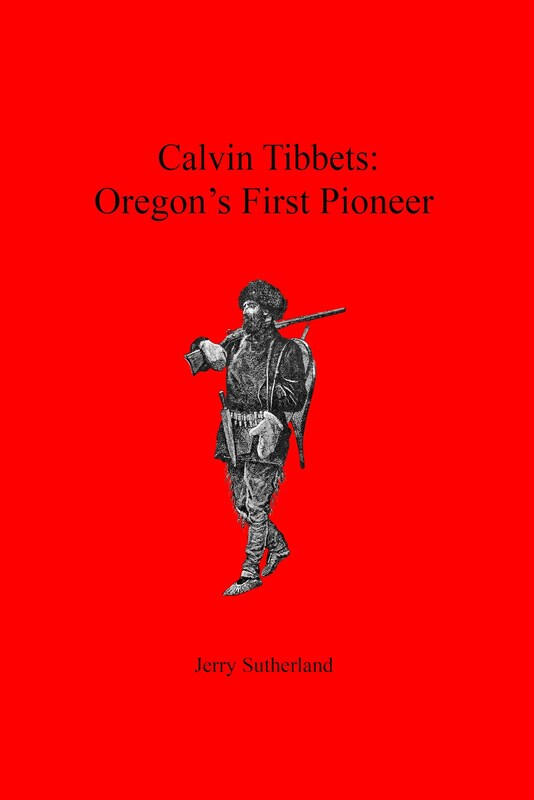 Finding the quarter corner monument discussed in Rewitness Card #56 was much easier because it served as the Bayocean Park surveyor's "initial point" in 1906, and has been maintained by the Tillamook County Surveyor's office ever since. One of the unmaintained corners is near the ocean beach, about 500' north of the northern-most trail that crosses Bayocean. 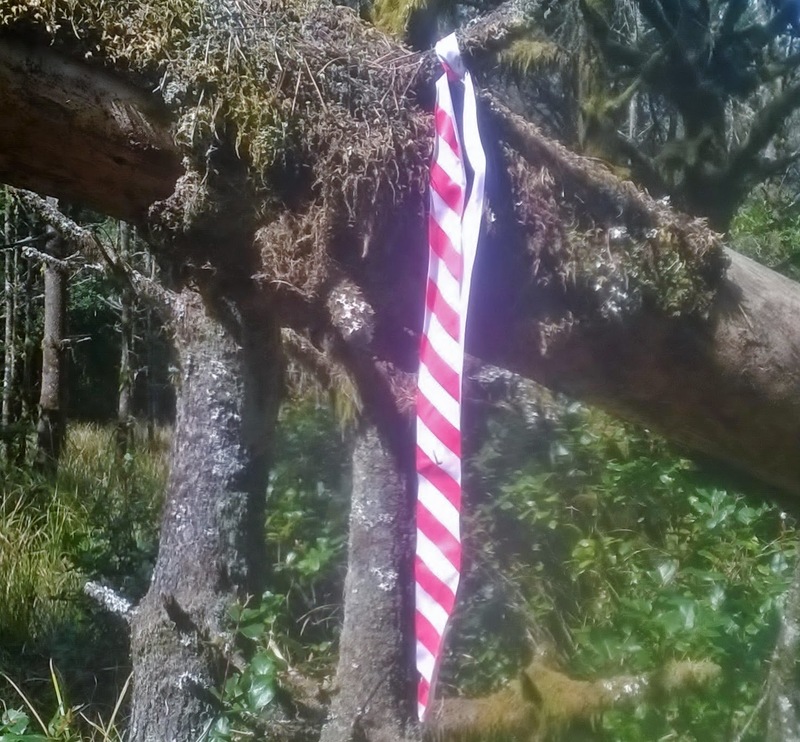 While looking around I found red-striped plastic ribbons hanging from trees. As I bushwhacked over to the bay side I found more of them. Later, I asked Del Shleichert, Director of the Tillamook County Parks Department, about the ribbons. He said they had nothing to do with them. I next asked Charles Ansorge, President of the Cape Meares Community Association, to put out an inquiry on his listserv. 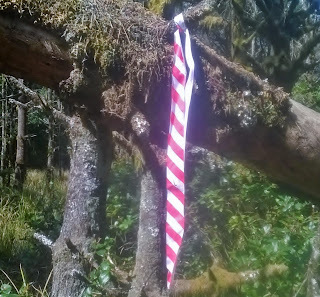 Robert (Ollie) Ollikainen responded that the ribbons might have to do with annual Air Force survival training. This seemed reasonable, since the northern part of Bayocean Spit is federally owned. On this Sunday through Thursday, Sept. 18th, the US Air Force was conducting coastal survival training exercises. Saw four young soldiers building shelters out of driftwood, putting up rescue flags, and otherwise going through assigned tasks. On bay side of the spit, I saw several trucks, a bus, many tents, and equipment for the exercise noted above. The soldiers appeared to be doing no damage to the beach area and, from what I later learned, completely clean up the area when they're through. The red-striped plastic ribbons certainly aren't the rescue flags "YaakovM" referred to. Paul Levesque said the Air Force notifies him when the training is scheduled, but this is not made public to avoid observers. The training focuses on hiding behind enemy lines when pilots are downed, so putting up flags didn't seem appropriate. The search goes on.